Imagine the brain being able to find out its own disease? Scientists have been making efforts to develop a material that “thinks” similar to the brain, which would be more sensitive to early signs of neurological diseases like Parkinson’s. The terminology is ionic currents, which assist the brain in carrying out a specific reaction necessary for something as fundamental as sending a signal to breathe. Detecting ions also implies the detection of the concentration of a molecule, which acts as an indicator of the brain’s health. In a research reported in Nature Communications, scientists have described the potential of a quantum material to automatically receive hydrogen upon being positioned under an animal model’s brain slice. The term quantum implies that the material possesses electronic properties that cannot be accounted for by classical physics and which give it a distinct advantage over other materials used in electronics, for example, silicon. In this case, the advantage is strong, “correlated” electrons that render the additionally extra sensitive and tunable. The goal is to bridge the gap between how electronics think, which is via electrons, and how the brain thinks, which is via ions. This material helped us find a potential bridge. Hai-Tian Zhang, Gilbreth Postdoctoral Fellow, College of Engineering, Purdue University. Zhang if the first author of the study. According to the researchers, over a longer term, this material could even offer the potential to “download” a person’s brain. Imagine putting an electronic device in the brain, so that when natural brain functions start deteriorating, a person could still retrieve memories from that device. Shriram Ramanathan, Professor of Materials Engineering, Purdue University. Ramanathan’s lab specializes in creating brain-inspired technology. 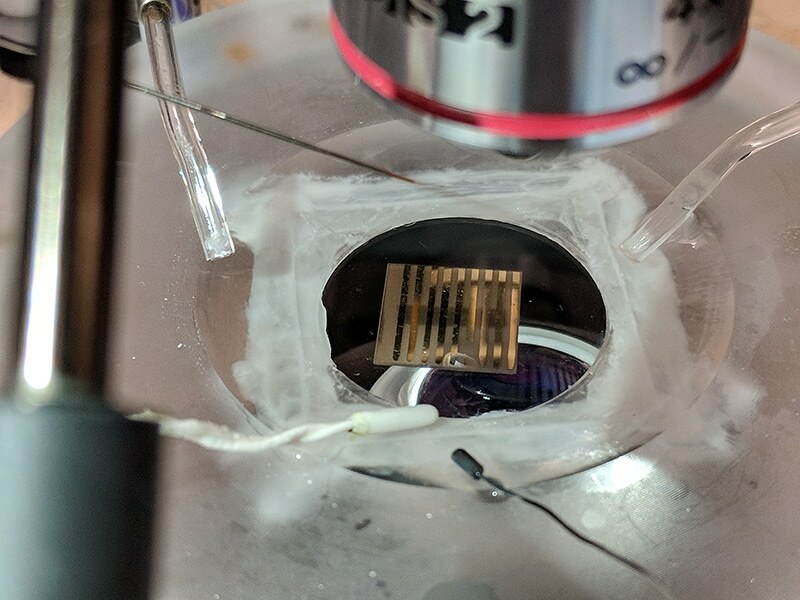 “We can confidently say that this material is a potential pathway to building a computing device that would store and transfer memories,” he stated. The material was tested by the researchers on two molecules: glucose, a sugar vital for the synthesis of energy, and dopamine, a chemical messenger responsible for regulating emotional responses, movement, and memory. Since the levels of dopamine are usually low in the brain, and still lower for people suffering from Parkinson’s disease, the detection of this chemical has been extremely challenging. However, early detection of dopamine levels would relate to earlier treatment of the disease. This quantum material is about nine times more sensitive to dopamine than methods that we use currently in animal models. Alexander Chubykin, Assistant Professor of Biological Sciences, Purdue Institute for Integrative Neuroscience, Discovery Park. The sensitivity of the quantum material arises from the strong interactions between what are called “correlated electrons.” At first, the researchers discovered that when the material was placed in contact with glucose molecules, the oxides spontaneously grabbed hydrogen from the glucose through an enzyme. The same occurred with respect to the dopamine released from a mouse brain slice. The strong attraction to hydrogen, as demonstrated when scientists at Argonne National Laboratory developed simulations of the experiments, enabled the material to extract atoms by its own, without the need for a power source. The fact that we didn’t provide power to the material for it to take in hydrogen means that it could bring very low-power electronics with high sensitivity. This could be helpful for probing unexplored environments, as well. The scientists also stated that this material had the ability to sense the atoms of a wide array of molecules, and not just dopamine and glucose. The future step would be to create a means for the material to “talk back” to the brain. The study was supported by Gilbreth Fellowship by the College of Engineering at Purdue University, the National Science Foundation, the Air Force Office for Scientific Research, the National Institute of Mental Health, the Office of Naval Research, and the U.S. Department of Energy Office of Science. This study also corresponds with Purdue’s Giant Leaps celebration, which acknowledges the global advancements achieved by the university in AI and health as part of Purdue’s 150th anniversary. This is one among the four themes of the yearlong celebration’s Ideas Festival, intended to exhibit Purdue as an intellectual center finding solutions to real-world problems.